Seattle Bus Accident Attorneys | Davis Law Group, P.S. People who take advantage of Washington state's public and private transportation systems, such as ferries, street cars, buses, and shuttles expect those systems to be safe. But operator error, mechanical failures, and other dangerous conditions contribute to multiple accidents involving Seattle and Puget Sound area transportation systems each year. The bus accident attorneys at Davis Law Group work on a contingency fee basis, meaning there are no up-front costs to hire us. Call our office at (206) 727-4000 today or use the contact form on this page to get started. As a lawyer with experience handling serious bus accident claims, attorney Chris Davis' expert legal opinions are often featured by the Washington state media covering transportation-related issues and specific bus incidents that have occurred in Washington state. You may have him on local stations such as KING5, KOMO4, KIRO7 and Q13Fox. Davis Law Group founder, attorney Chris Davis, is one of the most respected and recognized mass transit accident lawyers practicing in Washington state. He has handled several high-profile bus accident cases and has successfully resolved dozens of serious injury cases involving charter buses and other mass transit vehicles. If you have been in a bus accident in Washington state, investigators from the specific transit service will most likely want to interview you. It is advisable to retain an attorney before making any statements to investigators. A skilled lawyer can help you avoid saying anything that could later be used to deny or minimize your claim. Even if you've already spoken to investigators, it's still important to contact a lawyer in order to begin an independent investigation into what actually happened. READ: What will happen if I'm injured in a bus accident? Determining the cause of a bus accident is important, as the causes determines who’s responsible for your damages. Sorting this out is one of the first things an experienced bus accident attorney will do while working on your case. Bus company negligence. In an effort to turn a profit, bus companies may cut corners and ignore federal regulations, training procedures and safety measures. Bus driver negligence. While a bus driver may have caused the wreck, an attorney will look to the driver’s employer and see if inadequate training was the root cause. Bus driver fatigue. Bus companies that push drivers to log long hours can be held liable. Blind spots. A blind spot is a large area that cannot be seen by the naked eye or equipment (mirrors). Left-hand turns. Bus drivers making left turns are temporarily obstructed from seeing things such as pedestrians or other vehicles. Bad weather. While drivers usually have experience operating in the rain or snow, these weather conditions often caused severe accidents. Another driver. If another driver plows into a bus, that driver can be held liable for damages. Who is Liable for Bus Accidents in Washington State? Just as it is important to identify the at-fault party and determine any available liability insurance in a bus accident case, it is also important to collect and preserve evidence that proves liability for a bus accident case. The driver of the bus. If a bus driver is negligent and causes an accident that injures passengers or another driver, the bus driver and the bus company could potentially both be named as defendants in a lawsuit. Bus maintenance companies and contractors. Most bus and coach operators outsource maintenance work on their vehicles. If a maintenance company fails to properly maintain and service a bus and it leads to a crash, they could potentially be held legally responsible and therefore would be required to compensate the victim(s) for their injuries, medical bills, lost wages, and even pain and suffering. Bus manufacturers. Manufacturers are typically held legally liable for injuries that occur when a product they are responsible for manufacturing and selling poses an unreasonable danger to the public. An example of this might include product defects or known issues that cause safety hazards which can pose a serious risk to the general public. Other negligent drivers. 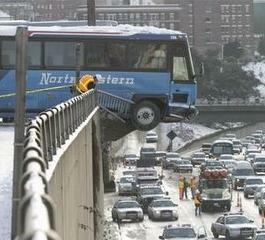 Sometimes, a chain reaction crash involving a bus or train can be caused by another driver's negligence. Drivers who cut off buses or are otherwise at-fault for causing a collision with a bus can be named as defendants in a lawsuit and their insurance company would be responsible for compensating injured victims for their injuries, medical bills, and pain and suffering. Commercial insurance companies fiercely defend bus accident claims, especially in cases where the victim's medical bills and pain and suffering are high. That’s why it is usually a good idea to consult with an attorney who has experience handling bus accident cases if you’ve been involved in an accident and any of these issues arise. A qualified lawyer can investigate the facts of your bus accident case and figure out who’s legally liable for your injuries, while also advising you on the best course of action. Most personal injury attorneys work on a contingency fee basis, which means that all attorney's fees are paid when the case has been successfully resolved. For a free case evaluation with an attorney at Davis Law Group, call (206) 727-4000. While transportation in Seattle and the Puget Sound region is largely by automobile, buses and other mass transit modes are gaining popularity. In the last decade as Seattle's population has grown, transit via bus has played an increasingly important role. In 2017, nearly half of commuters to downtown Seattle arrive via mass transit. Commercial buses. Ride The Ducks vehicles, school bus accidents, King County Metro Bus accidents, Sound Transit bus accidents, Community Transit, Vanpool, Vanshare, accessible services, etc. Private transportation systems. Carpool, shuttle buses, taxis, limos, Microsoft Connector, Shuttle Express, Airport Shuttle, Grey Line, etc. Ferry accidents. Washington State Ferries, Elliot Bay Water Taxi, Victoria Clipper Ferry Service, Argosy Cruises, Puget Sound Express, etc. Street car/trolley accidents. South Lake Union Trolley accidents, Seattle Streetcar, etc. Other Mass Transit accidents. Seattle Monorail, Link Light Rail, Sound Transit Light Rail, etc. The Statute of Limitations (SOL) for bus accident cases in Washington state is typically three (3) years from the original date of the bus accident, which means that all injured victims have a limited time to take the necessary steps in order to pursue a bus accident claim. Failing to file a claim within this time can result in the case being dismissed altogether and accident victims being left to deal with the costly medical bills and other damages on their own. This can cause significant financial hardship for victims and their loved ones. Davis Law Group's award-winning legal team has represented countless bus accident victims since being founded in 1994. We understand the nuances of pursuing a legal claim against a powerful company or government entity, and our legal strategy has proven to get our clients the best possible results. We also have the capacity to hire qualified experts to support our clients' cases, which provides additional negotiating leverage and motivates greedy insurance companies to resolve cases fairly and reasonably. If you or a loved one is suffering after being injured in a bus accident, it is likely in your best interests to consult with an experienced attorney about your rights and options. Our award-winning legal team can help you determine if hiring a lawyer may improve the value of your case and what your legal options are moving forward. We offer a free case review to anyone who has been injured in a bus accident. If we believe we can help, we'll schedule you for a free legal consultation with our attorneys. Use the confidential contact form on this page to get started or call our downtown Seattle office at (206) 727-4000. ?What legal rights do I have after a bus accident? ?What should I do if I've been injured while using mass transit in Washington?